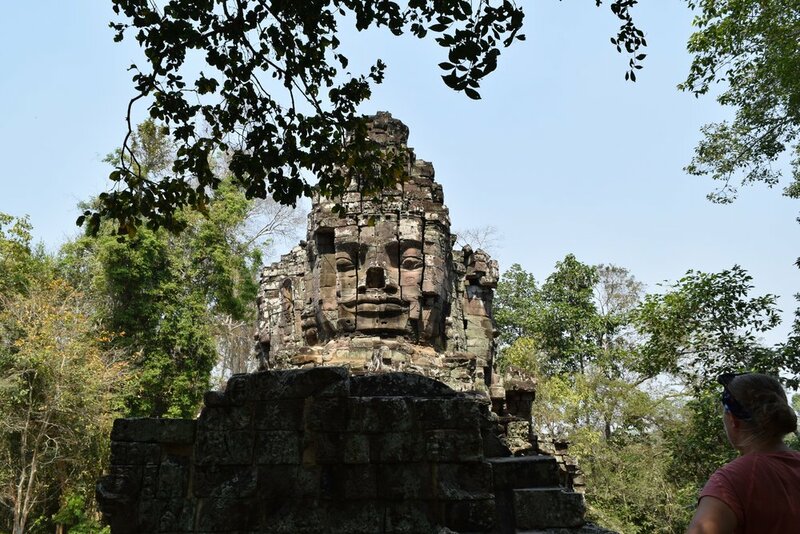 If you travel to Cambodia, most likely you will include a visit to Angkor Wat. 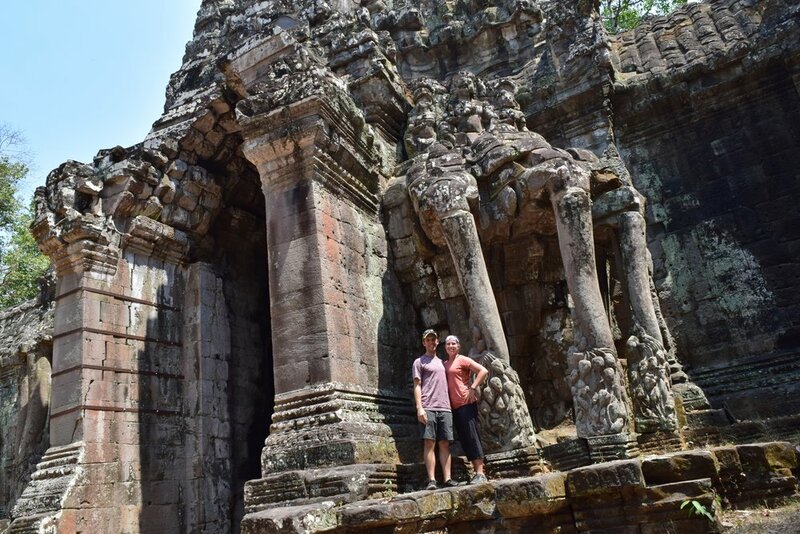 Before arriving in Siem Reap, Jeff and I didn’t really understand how extensive the temples were. We bought a 3-day pass (the prices were raised to $62/pp just before we arrived), and still didn’t see every temple! If you purchase an Angkor Wat ticket and enter the ticketed area near the temples after 5 pm, they don’t charge you for that day. 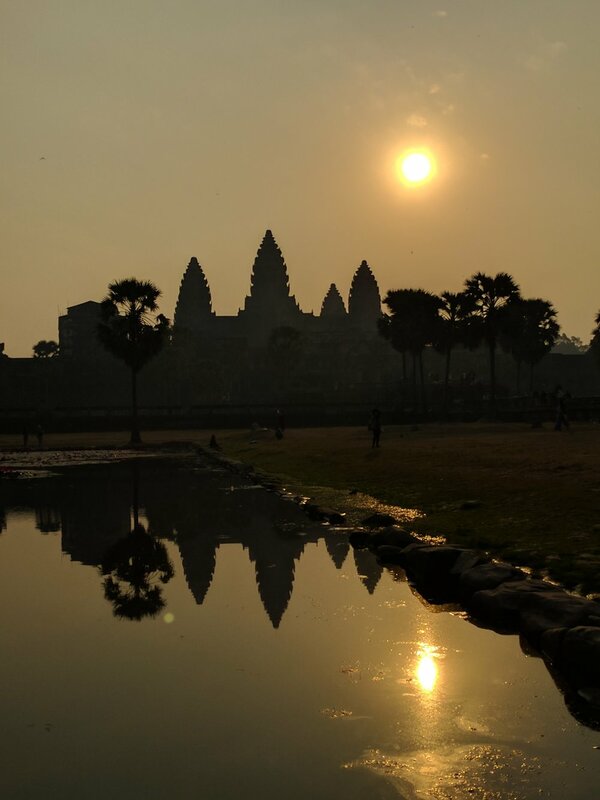 So basically, we got to see a free sunset at Angkor Wat! 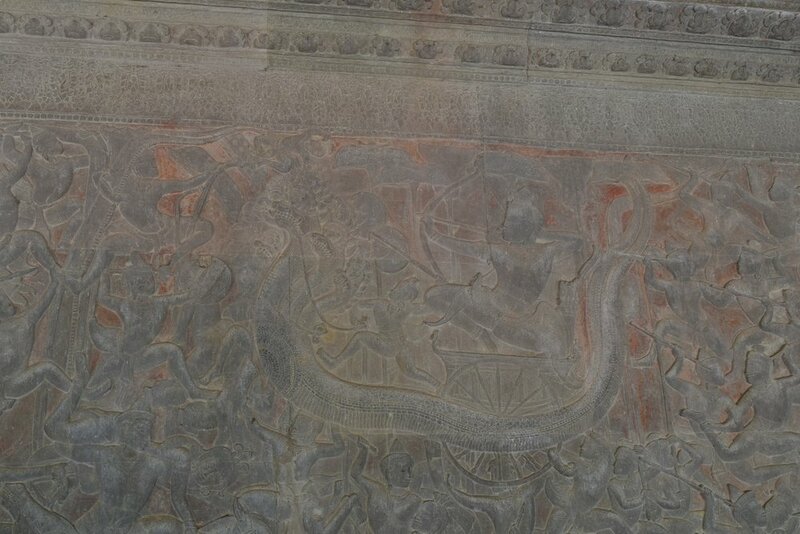 Angkor Wat is the largest and most famous of the temples. I was so impressed when we got there, I kept walking slow and ‘ooh-ing’ and ‘ahh-ing’ while Jeff was trying to rush me along. I didn’t understand why, until I realized that I was just ‘ooh-ing’ and ‘ahh-ing’ at the outer temple wall. Once he got me inside the complex, I understood what he really wanted to go see! 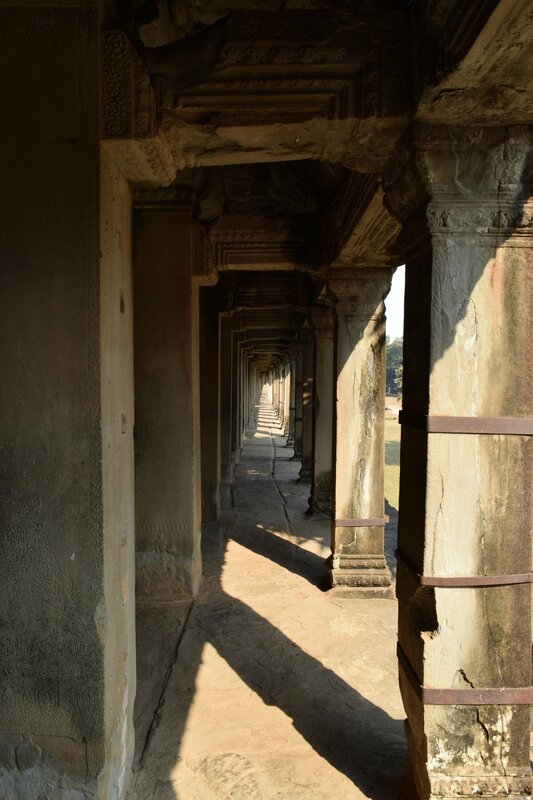 The view of Angkor Wat....once you get through the fascinating outer gate. There were always a ton of people there! 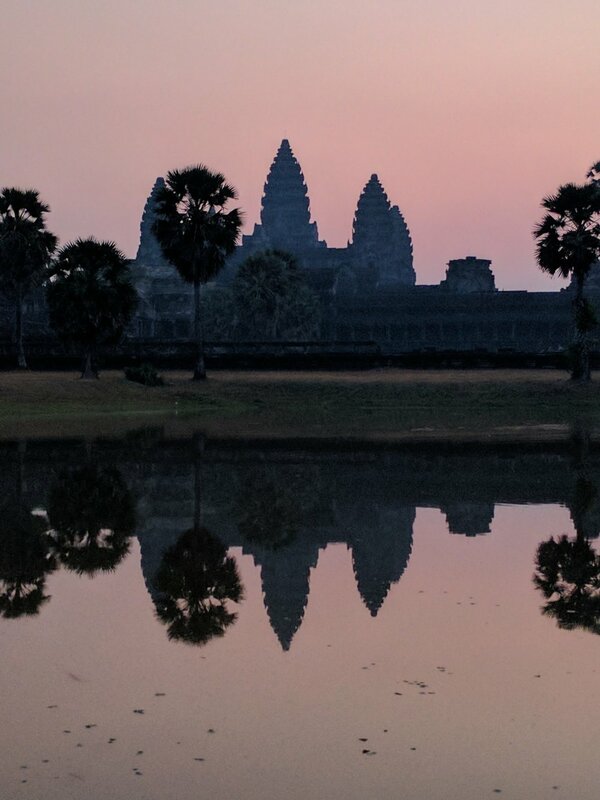 We woke up super early the next morning and met our tuk-tuk driver, Mr. Sarath, at 5am to go back to the Angkor Wat complex to see the sunrise. After sunrise and exploring some of the actual Angkor Wat complex, we hopped back in the tuk tuk and headed to the temples much further away, riding about 25 kilometers outside town to see a large temple area and some carvings along a waterfall in the same area. We hit a few more temples on the way back into town and we were both getting really tired so we called it a day, thinking we quit to early in the afternoon because it was about 3 pm. Then we remembered we had gotten up into a tuk tuk at 5 am for sunrise and didn’t feel to bad about a 10 hour day. 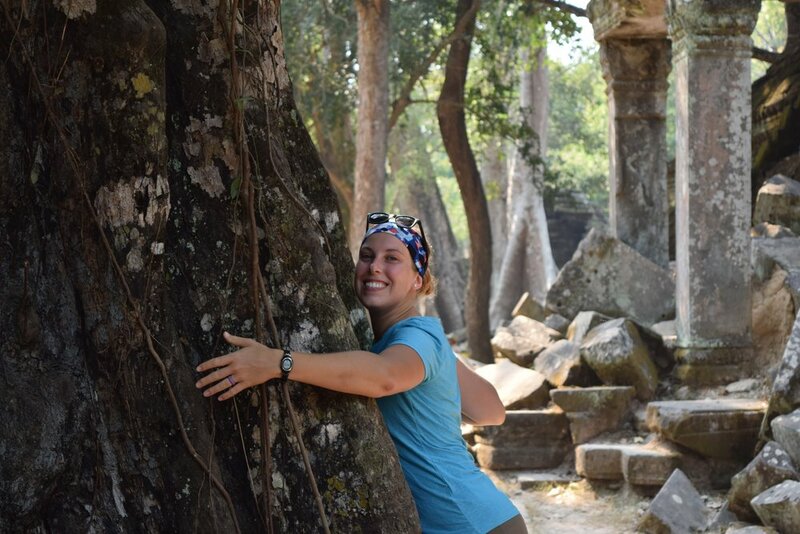 On that first day we visited: Angkor Wat, Banteay Srei, Kbal Spean waterfall, Prerup, and Ta Prohm (where they filmed Tomb Raider). Our hotel offered bike rentals for $2/day, so we figured we would get some exercise and see temples! We used bikes to get around for our last 2 temple days. It allowed us to make a pit stop outside of town at Wat Thmey, which was used by the Khmer Rouge as a prison and killing field. The bones on display are a stark reminder of the Cambodia’s history. NOT fun fact: during the Vietnam War (‘65-’73), the US dropped more bombs on Cambodia than the entire Allied forces dropped during all of WWII. It’s crazy to think that after all of that, the Cambodian people faced the genocide of the Khmer Rouge. We spent a lot of time at the genocide museum in Phnom Penh, but I am glad we stopped at Wat Thmey in Siem Reap also. I like to think that Cambodia is way beyond its dark period, but I think it still has a ways to go. We have seen a lot of poverty during our travels, and while I wouldn’t say Jeff and I are immune to it, we understand it is common in parts of the world we have traveled through. But that afternoon outside of one of the temples I saw three little street urchins hunting through trash to collect water bottles (they can get money for recycle). I watched one of the little girls, maybe 5 yrs old, find a discarded smoothie in the trash and then tried to use the straw to slurp up any remaining piddles of liquid. Broke my damn heart. 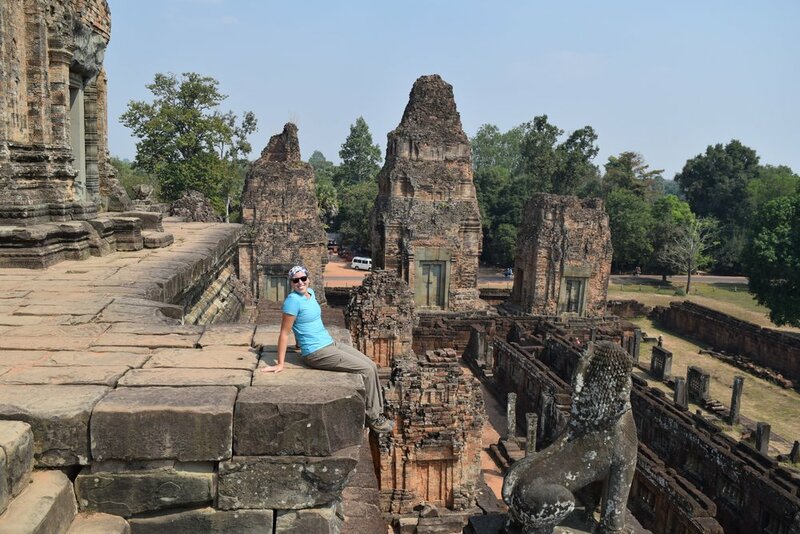 On our bikes over 2 days, we visited: Bakheng Hill, Deads Gate, everything in the Angkor Thom complex, Bayon, Ta Keo, Spean Thma, Ta Keo, Chapelle de l'Hopital East and Angkor Wat again. On a lighter note, every temple we visited was amazing. 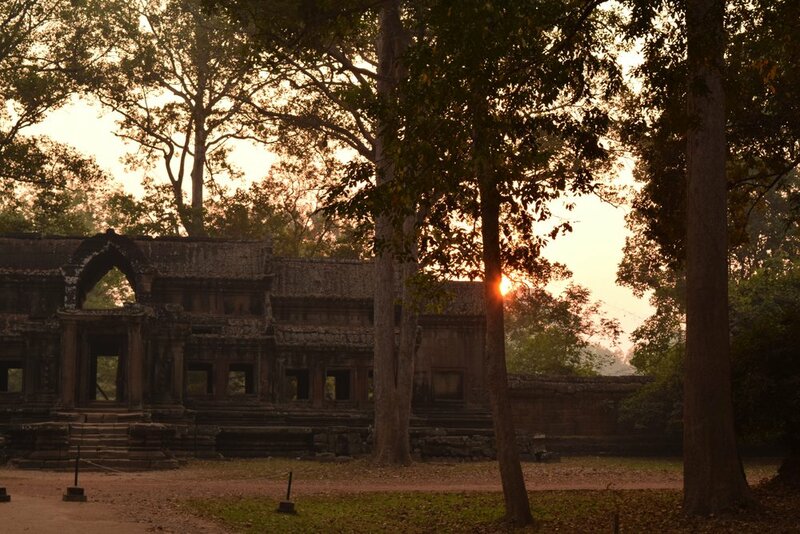 To claim that the Angkor area is a wonder of the world is accurate. 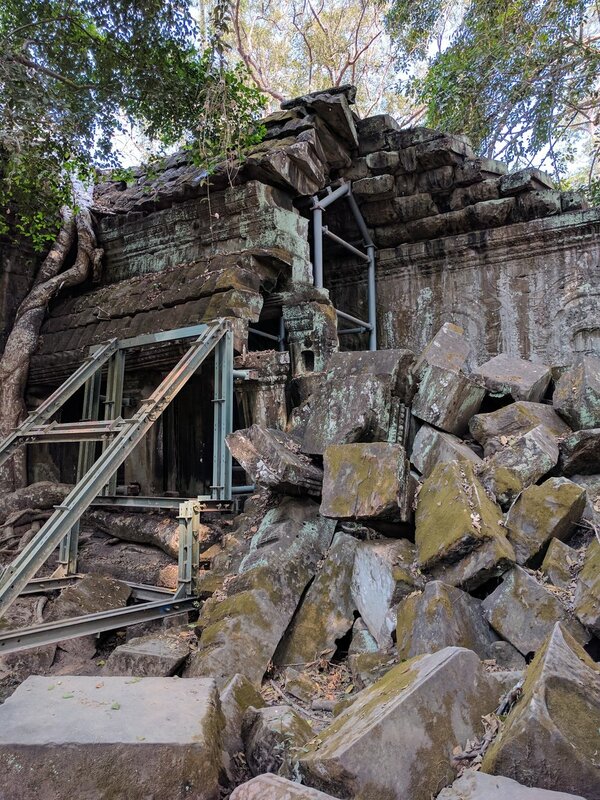 Cambodia definitely has a gem, and seems to be working to repair damage to temples and ensure that future visitors will be able to see the temples. We spent 2 days on bikes and were able to get off the beaten path - literally, we were in places that the tuk-tuks couldn’t get to. This meant that we got some of the temples all to ourselves! On one of our last nights in Cambodia, we took a tuk-tuk outside of town and saw Phare, Cambodian Circus. It was worth a visit! 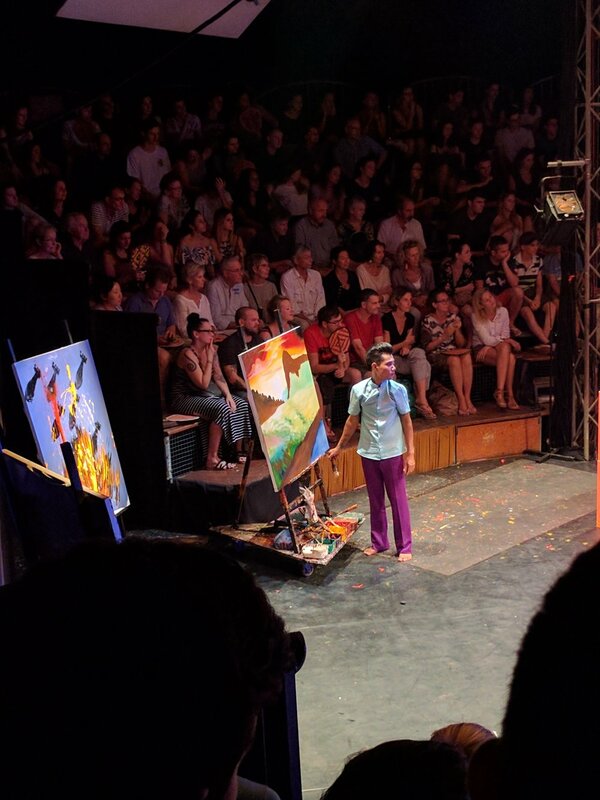 Not quite as impressive as circuses we have seen in the States, but they did have an artist who was painting part of the story line during the whole show and it was impressive! I thought it was really unique to incorporate that kind of art into a circus. Because we spent quite a bit on diving, Cambodia because one of our more expensive stops. If you removed the diving costs, our average per day would fall to about $75, which would be right between Vietnam and Thailand. The temple price went up at the beginning of February too, increasing from $40 to $62, and considering that most days we spent less than $20 for both of us to eat for the day, that change made a significant impact too. We definitely did some cheaper options (renting a bike ($2) vs getting a tuk tuk for the day ($15-20) and eating mostly street food instead of in the tourist and fancier restaurants), but we also spent a little more to stay at a nicer place in Siem Reap instead of the bare bones backpacker hostel (still only a little over $20 a night) and went to the circus. I feel like we got a really good picture of Cambodia and saw most of the big-ticket items. 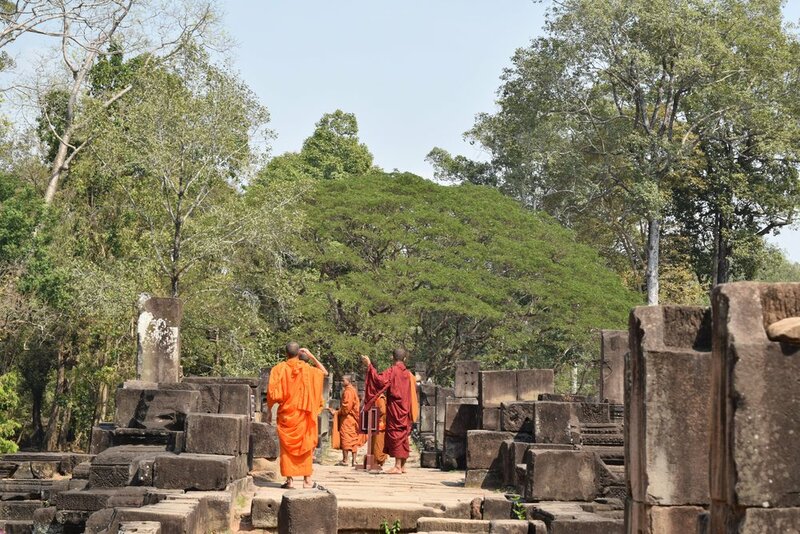 Overall I would put the cost of Cambodia right on par with Thailand and Vietnam, and like most places the big costs come in lodging and transportation so depending on how many places you want to go and how high class you want to be while you’re there. Any of the temples seemed to be a very popular place for wedding photos!